EVRoadtrip – HubNut – celebrating the average! Pushing electric cars to their limits. This is a little additional post, following my experiences where I got a range calculation very wrong. It isn’t part of the main roadtrip, but a separate trip I undertook after a day of rest. Firstly, I had to get to Cannock, which is 102 miles away. I’d been out the night before and as I don’t have a home charger, I’d plugged the car in when I got home at 10:45pm. When I went to leave at 9am the next morning, the car was still charging. This is the downside of a bigger battery – it takes longer to charge up! Most LEAF owners will have a fast charger at home, which should charge a LEAF up in just a few hours, depending on which charger is fitted to the car. However, I had over 100 miles of range, so off I set. As the journey went on, I began to realise that while I could make it to my destination, I probably wouldn’t have much left ‘in the tank’ when I got there. 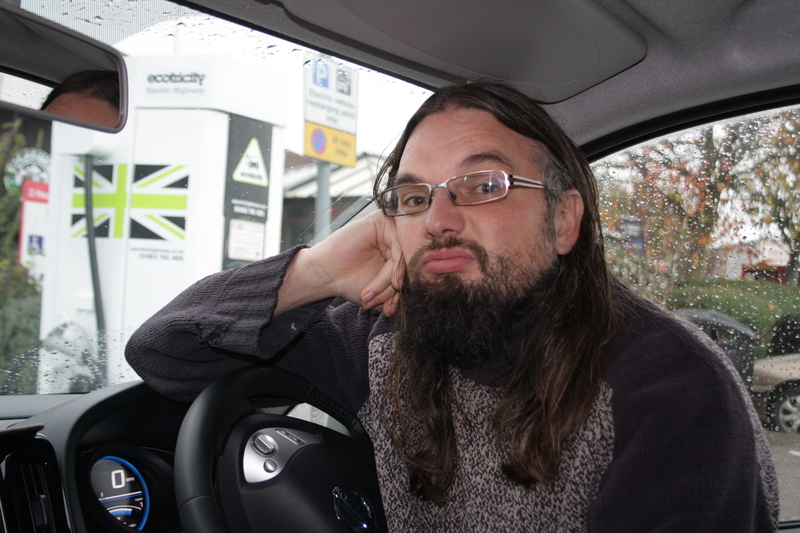 I suspected my chums would want to have a quick ride in the car, so stopped at Telford for a quick ten-minute charge. That took the battery back up to 51%, putting in 7.2kwh of juice. A joyful morning was spent watching awful cars fetching baffling amounts of money at a car auction before I headed off for the next leg. A friend had offered me a set of wheels and tyres for my 2CV Project, so I now headed south to Stow-On-The-Wold in the Cotswolds. Hilton Park services on the M6 was handily placed, so I headed there for a charge-up. Sadly, I utterly failed to remember how much juice I put in, but I felt it was comfortably enough to get to Stow, then to proceed to Strensham Services on the M5. Cruising around The Cotswolds was truly joyous. I risked ruining the aerodynamics by opening the windows as I whispered along the lanes. With the tyres and wheels collected, all of which fitted in the generous boot, I headed for the M5, where I arrived with 13% battery remaining. I suspect the enormous 50mph section through the M5’s roadworks helped the range a great deal! I’d checked the status of the chargers before I set off, but forgot that one of the Strensham chargers is offline. I spent several frustrating minutes trying to get it to work before giving up. Sadly, there was a Mitsubishi Outlander PHEV at the other charger, and the display indicated it hadn’t been there long. Some EV owners get angry about these hybrids, as they don’t HAVE to charge up – the joy of still having an actual engine. I’m not like that. Electricity helps improve the economy, so it could be argued they’re just as welcome at the chargers as EVs. After about ten minutes, the owners came back. I suspect they would have liked to keep charging, but they were kind and let me take over. I had to fend off another PHEV that had just arrived, but they were kind and understanding too. It didn’t take long for me to realise that I was in a spot of bother. I think it was after about 20 miles that I realised this was going to be a struggle. You see, the route from Worcester to Wales feels like it’s almost entirely uphill! I felt ok with 15 miles between range and distance to cover, but that gap soon began to close up. I started to deploy the first stage of panic stations. No air con and letting the speed drop by 10-15mph going up hills. I limited to the top speed to 53mph (a realistic 50). For some time, range and distance remained near-identical. I’d drop into negative figures when climbing, but would get miles back coming down the other side. Not enough though. My back muscles began to tense, and an uncomfortable feeling developed in my stomach. Ah yes. My old friend range anxiety! I desperately tried to conserve momentum, using racing lines to try and keep my speed up through bends. My economy went up, so it was having some effect. Would it be enough though? Approaching Leominster, things were getting so worrying that I refused to overtake a tractor. The anxiety was extra bad because I’d stupidly left the 13amp charge cable at home. That meant that it was impossible for me to just find a kindly person to pinch some electricity from. My only option was to push on for home. After Kington, there’s an awfully steep climb before reaching Pen-y-Bont. I allowed the speed to drop to 30mph, despite the 60mph limit. As we came down the other side, I allowed my speed to build, pressing the throttle enough to cancel the regen, but not so much that power was used to build speed up. Regen was employed for sharp turns, but my speed was still very low. I couldn’t build up enough momentum and was soon on the power again. The range continued to sit at a lower figure than the miles remaining as I headed toward Rhayader. I’d turned the speed limiter off at this point. I’d control the pace and keep it slow as I climbed, but if I could get up to 60mph going downhill without using power, I would, employing the subsequent regen before the inevitable bends, but only slowing down just enough to get around the bend. The aim was to avoid heavy acceleration on the exit. As we snaked along the A470, I was starting to think this was hopeless. I had 18 miles still to go, but only 14 miles of range. My speed dropped to 40mph and I nervously kept watch on the rear-view mirror. People who overtook must have ended up thinking that these electric cars are hopelessly slow! At Llangurig, I had 13 miles to go, but now just ten miles of range. I also had to climb over the Cambrian Mountains again. I called home and requested emergency help! Rachel dashed to the garage, grabbed the 13amp charging cable and hopped in her Perodua Nippa to come to the rescue. I pushed on. Would I actually get to find out what it feels like to run out of juice? Even the LEAF was worried. Not that it could find any charging stations in mid-Wales! By now, I was doing 30mph as an absolute maximum, and even less when climbing. Thankfully, it was after 8pm at night, and traffic levels were very low. The range kept dropping. With 11 miles to go, the range dropped first to 8 miles, then went blank. It was refusing to tell me how far I could now go. I checked the battery level. That also was refusing to tell me how much was left. My back was no longer touching the seat because I was so tense! However, owning a 2CV means I know a few tricks about conserving momentum. It’s about being as smooth as possible. I continued to use racing lines, and allowed speed to build when gravity could assist. I eased the car over the crest at Eisteddfa Gurig and allowed myself a smile. Now, I had a fighting chance. The road immediately began to drop steeply. Balancing the throttle, I allowed the car to get up to 60mph, before employing medium regen. I’ve no idea how much power I generated on this section of slopes, but we were still moving. Excellent. Fuel light roulette, EV style. I then reached the ‘splash road,’ or the B4343 as it is known on maps. This was another steep climb, but no traffic was approaching, and I could crawl up at 20mph. A flying Perodua came towards me – the rescue team! However, there were now just four miles to go, and once I crested the hill at Parcgwyn, I knew it was mostly downhill. Arriving at Devil’s Bridge, I felt much calmer. If the battery level was dangerously low, the LEAF would have gone into ‘turtle’ mode, where it really cuts back on the power. I still had a small hill to climb, and the car did it easily. But I’d done it! I managed to coax the car home. The relief was palpable. I’d managed to cover 11 miles with dire warnings of extremely low battery level, in hilly terrain. Made it! Phew. Back home. In conclusion, this highlights the problem with living in rural Wales. There just aren’t any charging options. At all. Stay close to the motorway network and range anxiety just isn’t really an issue. Departing from it is still a bit of a leap of faith though, and it must be said, driving with range anxiety is no fun at all. This is exactly the opposite of joyful motoring, though it does also remind me how much fuel is used to keep speed up on hills, and to accelerate away from bends. Just one rapid charger along the length of the A44 would have taken the stress away. A ten-minute charge would have been plenty. Then I could actually have enjoyed this great driving road, because the LEAF handles well, rides well and is actually very pleasant to drive. The infrastructure has improved hugely in the 2.5 years since I last tested a LEAF, and none of the long trips I have made this time were even remotely possible back then. This was my second 300-mile day in the LEAF, taking me to 720 miles covered in just three days of driving. It proves that electric vehicles are viable, but I have also proved that when it comes to Wales, issues do remain. Now was the time to truly test the LEAF’s potential. We awoke in Liverpool, and now needed to get to Bradford in West Yorkshire for an appointment with what remains of my 2CV. The first plan was to escape Liverpool, which proved more difficult than expected as I was still having trouble trying to work out where the sat nav wanted us to go. We made it to Warrington and the M62 in the end though, and pulled up at Burtonwood Services for a charge. There were two issues here. First, I was having to stop before I really wanted to. Having not found an overnight charge point, I was now stopping after less than an hour’s drive. Secondly, the charger wouldn’t work. It refused to initialise, so that was that. Fortunately, there was another charger, and that worked just fine. Twenty minutes took us back to 100 miles of range. We were only going 52 miles, but we had to climb Windy Hill on the M62. That was going to chomp through range. A successful charge. The other charger refused to play ball. I love this colour. I wasn’t wrong either. Over four miles of climbing, we lost 20 miles of range. Granted, I was keeping my foot in. If you want to save energy and boost economy, in any vehicle, then let it lose 10mph on hills. You’ll save a ton of energy. The torque of the electric motor certainly has advantages once you’re out on the moors though. Hillclimbing is easy! No downshifting or kickdown, just power when you need it. Best of all, you get power back going down hills too! Rather than just creating lots of waste heat, like normal brakes, the LEAF turns the motor into a generator to give a strong engine braking effect. Actually, you only get that in B mode – using the gear controller, you can select D or B. D gives far less regen when you lift off the throttle, only giving it when you press gently on the brake pedal. Press hard and the service brakes actually kick in. I prefer B mode, as you can effectively one-pedal drive. After vising the 2CV and having a bit of a mooch on the moors, we headed for the rapid charger at Bradford. One long descent here was enough to put 2% back into the battery. I was amazed. We arrived at Welcome Break services near Bradford with only 11% battery remaining. Knowing we’d easily get to the charger, I must concede that I’d been enjoying the acceleration potential a little more! We charged for a full half an hour, which took the range back up to 111 miles. An electric cruise around the Yorkshire moors. The break gave me chance to do two things. Firstly, I called up The Electric Highway on my phone. I was planning to stop at Knutsford for juice, but that was only about 40 miles away. Could we make it further? Keele Services was shortly before we came off the M6, in Staffordshire, so I decided to head there. It was an 81 mile jaunt. Should be easy. The second thing I did was check social media. Now, here’s a really interesting thing about electric cars. If you post stuff about them on the internet, people will take great pleasure in pointing out how rubbish they are, and how an electric car would never work for them. Well, obviously! If you’re clocking up hundreds of miles a day, then an EV is not a particularly quick way to do it. Similarly, if you’re looking for an off-roader, I wouldn’t suggest you buy a Jaguar XJ6. People get very, very insistent though, and I wondered why that is. Bit dark inside. Beige was an option earlier in the LEAF’s history! I think it must just be because some people are very defensive of the internal combustion engine. I get that. A LEAF is fun, but it doesn’t thrill in the way something with a V8 can. There’s no soundtrack. However, I personally really like EVs and the way they drive. I love the feel of electric traction, whether that’s in a modern electric car or on a train or trolleybus. Electricity feels efficient, in a way combustion engines just don’t. Over half of the potential energy you hurl into a car is turned into heat, and nothing more. The vast majority of the energy you put into an EV propels you down the road. Sure, there are transmission losses in getting the power to the car, and questions about how environmentally friendly that electricity is in the first place, but I don’t care. I’m not here to present the LEAF as some miracle, environmental solution. I just enjoy driving them. Anyway, after amusing myself with social media, we set off again. The weather and traffic both turned against us at this point, and having got my economy back up to 4.4 miles per kwh (it dropped to 4.3mpkwh in the hills), I soon saw it drop away again. The reason? Stop-start traffic. By switching to a live economy readout, I could see the horrible effect that repeated accelerations have on power use. Even just gently moving away up to 10 or 20mph uses a good chunk of fuel. You’re having to overcome inertia every time. This all meant that the 111 miles of range had taken quite a battering by the time we arrived at Keele. The battery had dropped to 10% and we had 12 miles of range left – we should have had 30 left if the car’s initial prediction had come true. Some of that may have been because I used the cruise control. Turning it on immediately drops the range by a good few miles – presumably because the car will accelerate back up to speed with rather more aggression than I would myself – albeit ECO mode tones down that rate a bit. We had also run the whole way with the air con on, because the weather was appalling. There was a slight issue though. The battery temperature was starting to rise, and another rapid charge didn’t seem very welcome. From what I’ve seen online, this seems a quirk of the 30kwh LEAF, and there is plenty of anecdotal evidence of it happening. Now, don’t get too alarmed, because the level on the gauge apparently meant a temperature of 52-59 degrees C. It’s hardly about to combust. I am awaiting feedback from Nissan on this issue though, and will report back once I have it. The LEAF has no active battery cooling/heating, so it isn’t using any of the energy to regulate the temperature as some EVs do. My main concern was that it would either start reducing power output, or perhaps charge speed. It didn’t seem to do this. Actually, there was another issue. There were two chargers, and one was in use by another LEAF. The owner was nowhere around, so I went to the other charger. Which was showing a fault. At this point, I did something desperate. I phoned up Ecotricity via the number displayed in large numerals on the charger. The chap calmly talked me through the reset procedure. It seemed someone had pressed the emergency stop button – I have no idea why. This needs resetting manually at the machine – they cannot do it over the internet. For future reference, this does not need any intervention by Ecotricity. If it can’t reset after an emergency button press, press the button again, then twist it to the right, at which point it should pop back out. Clear the error and the charger should reset. Phew. Someone had pressed this. Needed a manual reset. 22 minutes got us back up to 78% and we could head off to visit ECAS 2CV Parts for more 2CV goodies. It must be said, we were not running to a tight schedule. If we were, then I accept this charger nonsense would not be welcome. We’d already stopped three times on this day, and as we approached Shrewsbury, we needed to stop again – fortunately arriving at the charger just as a BMW i3 was leaving. This charger was right outside a Starbucks, which we obviously ignored. We found a brew elsewhere and with that consumed, had enough juice to continue home. We arrived home having covered 414 miles, over 300 of them in this one day. It must be said, that this really felt like progress. It was no particular hardship and I very much enjoyed the driving experience – even if the automatic wipers seemed to become rather lazy. Sure, long journeys are still not as relaxing as in a normal car – the XM had a range of over 800 miles – but, such journeys are now possible in a way they just were not only a few years ago. The elephant-in-the-room is perhaps still price. This was not a top-spec LEAF and it still has a near-£30,000 on the road price (not including £4500 government grant). That said, there are some very tempting lease deals out there for the LEAF, and those deals also have the advantage of no battery worries. I know that battery life is an issue for some people, even though real-world circumstances seem to suggest that the LEAF battery is very hardy – 150,000 miles should be easy. The range will still cause some people anxiety too. The thing is though, the 30kwh LEAF simply removes that awful ‘am I going to make it’ knot in the stomach that some EVs deliver all too easily – with a caveat that I’ll get to next time! Yes, you still need to plan long journeys with care, but the distances between chargers mean that actual range anxiety isn’t really an issue anymore. And here’s the thing. A Volkswagen Golf 2.0TDI Match is apparently £25,000, so that’s really not an awful lot less than a LEAF. In quality terms, the LEAF is right up there, with the added advantages that there has been no dodging around emission tests. Personally, there’s no way at all that I’d consider buying a modern diesel engine – they’re too complicated, have too much that can go wrong, expensively, and create some truly grim particulates, despite manufacturers best efforts. No, if I were in the market for a brand new car, it’s electric that I’d be considering. Any disappointment with range is made up by the fact that the LEAF is actually a really good car, and an exciting one too. I can cope with the regular recharging, because my job doesn’t often come with tight time constraints. Besides, even if I did go electric, I’m not someone who tends to have just one car! As mentioned in the previous post, we found ourselves with 98 miles to travel to the rapid charger at Chester in the 30kwh LEAF due to the intermediate one having broken. I was very concerned, after a near-failure involving a Volkswagen e-UP! last year. In that, I only just managed to make it home from the rapid charger at Oswestry. As it happens, I needn’t have worried. There was no drama. 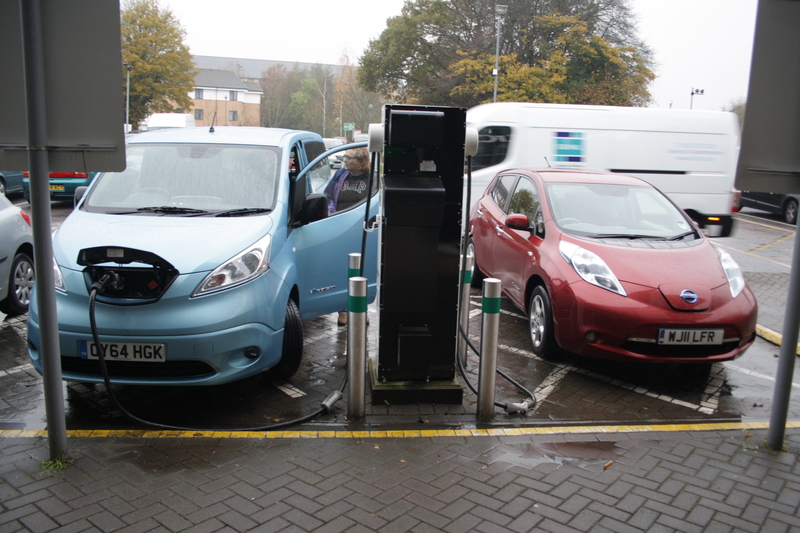 In the LEAF, we sailed past said rapid charger with 77 miles of range still showing! I had enough juice to turnaround and drive back home if I’d fancied it. We were off to Liverpool though, so I didn’t do that. First rapid charge, after 98 miles of driving. Now, I wasn’t doing anything special to boost economy in the LEAF, though perhaps I was deploying a few small tricks. For a start, I was in ECO mode. This makes the air conditioning less power draining, decreases the throttle response and reduces the total amount of power you can access. We needed the air conditioning throughout the journey, as the conditions were horrific! Lots of rain, so lots of headlamp and wiper use too. That was fine really, as I wanted to test the car in everyday conditions. The other trick was gentle acceleration. I’d estimate that I was getting up to 60mph about as quickly as my 2CV manages it – a 0-60mph time of 30 seconds. Acceleration batters your range, whether in an EV or a combustion-engined car. It’s why you always get better economy on a long run – it generally involves more travelling at a consistent speed. You know when you’re driving well, as you start acquiring ‘trees’ on the dashboard. I’m not sure how they actually work, but found it quite easy to amass a veritable forest. A veritable forest. But what does it mean? I refused to actually lower my speed so, where traffic allowed, I would do 60mph if that was the legal limit, and I increased that to 70mph on the motorway once we reached it. This was the most enjoyable aspect of this. 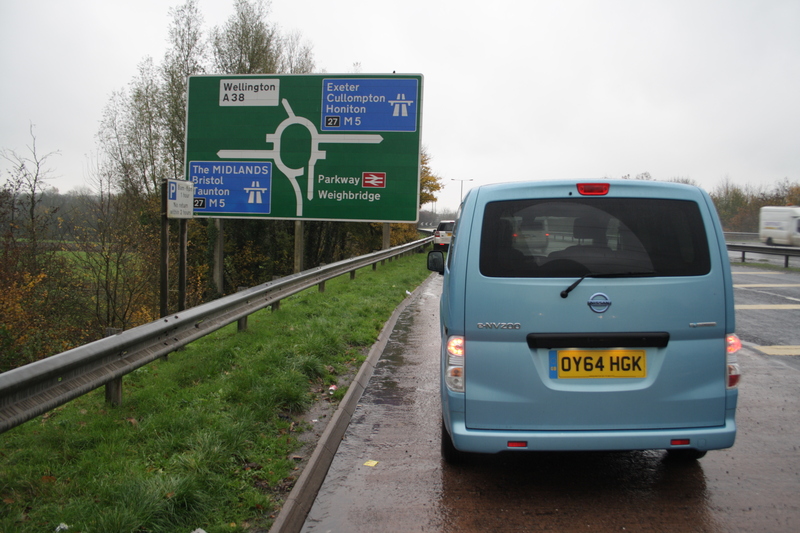 The e-NV200 roadtrip had seen us cruising along at a miserable 50-60mph on the motorway, often freezing cold as we desperately tried to eke out every bit of range. I was being spoilt in the LEAF. Range anxiety just wasn’t an issue. Well, that’s not entirely true. At the start of our journey, which saw us climb over the Cambrian Mountains, the range did drop down to 88 miles, when we had 88 miles left to cover. Experience has taught me not to stress in such circumstances though. By the time we reached Newtown, 30 miles away, the range was back up to the 105 miles it had been predicting before we set off. This highlights that the range is only a guide really. It can’t hope to predict how you’ll drive, nor how hilly the terrain is. I’ll do a proper review of the LEAF later, but I was certainly enjoying driving it. When I first drove one in November 2013, it was a frustrating experience. It felt like a great car for covering distance, but I wasn’t within range of any rapid chargers at all at that time. I was stranded in mid-Wales. As cars go, it couldn’t be more simple really. There’s a go pedal, and a stop pedal and a steering wheel. The biggest downside to the Oswestry charger being down is that we now had to go out of our way to find power. A quick trek along the M56 was necessary to access the pair of chargers at Roadchef Chester. As we arrived, one charger seemed to be getting glued back together by a chap in a French-registered van, but a second charger was free and ready to use. Rapid charger being ‘glued’ back together. The charging process is as follows. Press the fuel flap release, which unlocks the small panel in the nose. Flick open the cover on the main charging point (there are two, the smaller one is used for smaller chargers ie home use). Grab the DC rapid charging ‘gun’ (the charger has three cables) otherwise known as ChaDeMo (Volkswagen and some other manufacturers use CCS, for which there is a different cable). Now, press DC charging on the machine present your Ecotricy charge card (the Nissan press car came with one, but you can order one yourself. There is currently (June 2016) no charge). Wait for it to initialise, then the charging will begin. We’d been driving for over two hours by this point, at an average of over 40mph, so we were due a break ourselves. We brought along tea and cold toast, because motorway services are generally horrible and expensive (Gloucester and Tebay excepted). That is one downside of EVs. Most of the rapid chargers are at motorway services, which are almost universally grim places in which to spend time. After 20 minutes, the battery was up to 72%. As well as having greater range, it seems the 30kwh LEAF also charges more quickly. Sadly, I didn’t note down what the battery percentage was when we arrived, but I’d estimate it to be below 20%. We still had 24 miles of range left, having driven 98 miles (the car was wrong, Google maps called it correctly!) to get to the charger. Given the claimed 124 miles of range, that was pretty good going! You’ll note we didn’t charge up to 100%. There are several reasons for that. Firstly, we couldn’t be bothered to wait. We had enough to get to our next destination, why waste time? Secondly, the last 20% of the battery cannot be charged as quickly as the previous 80%. As the battery fills, it’s harder to squeeze the last bit in, so it could have taken a very long time to charge. Thirdly, it’s better for the battery not to repeatedly charge it beyond 80%. On the e-NV200 roadtrip, we had no choice. We often needed 100% (or close to it) to get from one charger to the next. Now, we had the luxury of not bothering. We overnighted in Liverpool, leaving the car in a general car park. We could have perhaps found somewhere with a charge point, but we’d be passing a rapid charger in the morning. That would do. Overall though, is it impressive that I managed to cover 98 miles with out recharging? Well, against a combustion-engined car, no it isn’t. However, it does make the LEAF feel a lot more valid. 98 miles was enough for a couple of hours of driving, after which we were very keen to stop anyway. Does that mean everyone should get an EV? No. It just means the limitations are perhaps less limiting now. A bigger test would be driving back home via Bradford, and covering over 300 miles in a day. That’ll be the next installment. Stay tuned! I haven’t conducted a proper EV roadtrip for a while, so I thought it was about time I had another go. My previous roadtrip, in a Nissan e-NV200 Combi, wasn’t very enjoyable at all. Can the new 30kwh LEAF do a better job? Firstly, let’s talk range. Even driving gently, I struggled to get more than 60 miles out of the e-NV200 between charges. That was against a claimed range of 106 miles. To be fair, I was conducting the test in November, so heater use was denting range, but it was still pretty poor. The LEAF should stand a better chance. It has a claimed range of 124 miles, which is probably closer in reality to the 106 claimed for the e-NV200. Anecdotal evidence certainly suggests so. The other advantages are a larger battery back (30kwh to 24kwh), better aerodynamics and heat-pump heater technology – not that we should need it, being summer. Allegedly. I’ll certainly be testing the range pretty thoroughly, and not out of choice. 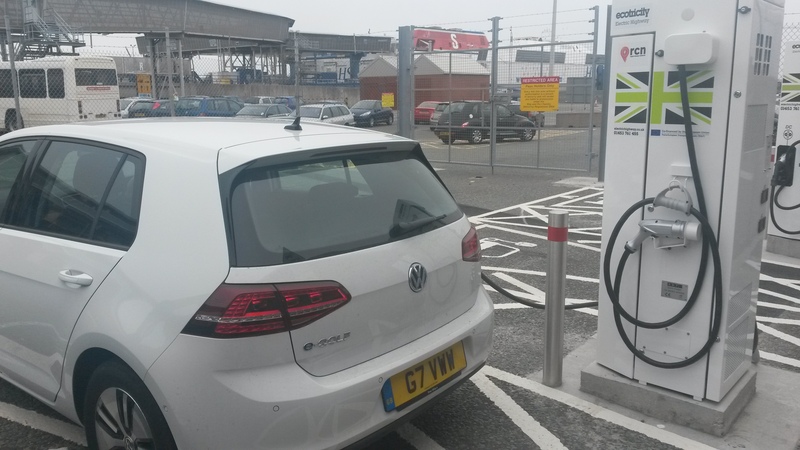 We’re off to Liverpool today, and the first rapid charger along the route is broken. It seems The Electric Highway is sadly still not entirely fit for purpose. Where this charger is located, there are no less than 16 pumps for internal combustion engines. If one of those breaks, it’s hardly the end of the world. As it happens, I now have to try and get to a rapid charger near Chester, on the M56. That’s 98 miles away, so the challenge is definitely on! First up, here’s a bit about the test vehicle. It’s Acenta spec, which is the lowest available with the 30kwh battery – you can have a Visia with the 24kwh battery and a few less toys. The on the road price, not including any plug-in grant, is a smidge under £30,000. The paperwork doesn’t confirm whether that price includes the Magnetic Red metallic paint – my favourite colour. The spec includes a reversing camera, heat pump heating and air con, lots of electric toys, auto headlamps and wipers, keyless entry and a 3.3kw on-board charger. That latter point is worth bearing in mind. It means that it can’t charge particularly quickly at some smaller AC chargers, such as the ones you can have installed at home. There is an optional 6.6kw charger, but that seems to be about another £1500! Some people don’t consider that worth paying, and here’s why. There are three basic charging options. 13amp plug, fast charger and rapid charger. The spec of the on-board charger only affects the fast charger option – typically a 16amp supply, or 32 if you’ve gone for the bigger charger. The sort of charge points you’ll find that use this are at home, in some car parks and even roadside in towns. I probably won’t use that facility at all. I’ll either be charging at home via the 13 amp plug, or using rapid chargers, which supply over 100amps at several hundred volts. That should get the LEAF’s battery up to 80% charge in around half an hour – it’ll be interesting to see how the real-life experience tallies with expectation. 80% charge should be good for 80 miles and once I’m on The Electric Highway, that should be more than enough to get to the next station and/or destinations. I’ll be live tweeting my experiences at http://www.twitter.com/dollywobbler and will, of course, be reporting back on here once the journey is complete. There will be video too. If you’ve got any questions about the LEAF, now is the time to ask! Sorry, it’s that car again! As I was rather depressed by an awful Telegraph ‘story’ in which this car was driven all the way from London to Brighton, I gave the e-Golf a proper, thorough, real-world road test. I covered 700 miles in one week, including 300 miles in just one day. The result is this in-depth video review. I hope you enjoy it. Road Test Part 4 – The 300-mile roadtrip. Part 3 (The not-so good) Here. Sorry, you’ll have a further wait for my conclusions on the Volkswagen e-Golf, as I first need to relate the details of my biggest ever electric car road trip. I began the day aiming to crack 200 miles in the day, though I’d actually done this before with the Nissan e-NV200. After failing the other day, I aimed to get a rapid charge at Oswestry on the Electric Highway. From there, I would hopefully head north – probably to Chester, though that opened up the whole of the M6 and therefore, much of England. Success! 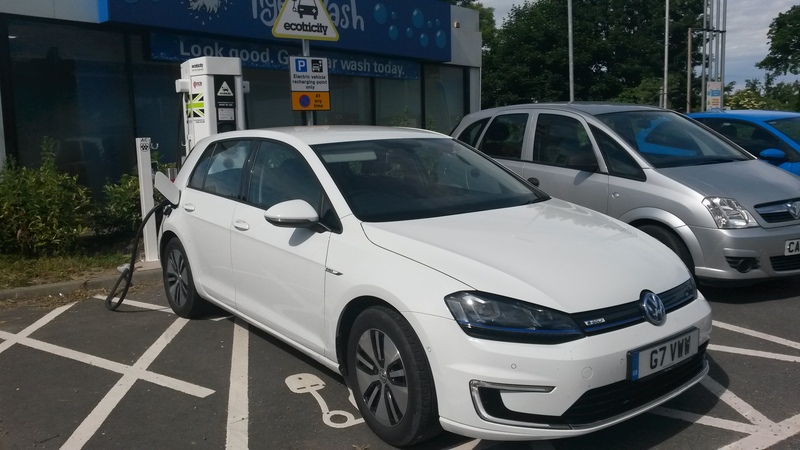 e-Golf slurps DC current at 110Amps. Now, things didn’t start all that well. The first two attempts to get electrons flowing resulted in a baffling error message. So, I did what any IT bod would do. I effectively rebooted it by removing the connector from the car and starting again. Third time lucky, and I could head off for a brew. It was definitely time for a brew, as I’d been driving for almost two hours by this point, having covered 62 miles on typical Welsh A roads. By the time I got back to the car, it was already at 85% charge! It had been at 48% when I arrived just 15 minutes earlier. Charging slows as the battery fills, so although going to maximum is not advised (certainly on a regular basis – it’s healthier to stop at 80%), I left it going and supped my brew. And perhaps a cookie. Soon enough, it was time to continue my journey. I headed up the A483 towards Chester. Now, Chester is a nice place, but the next rapid charger was a mere 35 miles away. That hardly felt like the stuff of adventure. Hold on. Isn’t there (bizzarely) a rapid charger on Holyhead? A quick consultation of Ecotricity’s map revealed that this was the case. Sat nav reckoned it was 92 miles away. The range estimate was 98 miles. Easy! Of course, I may have neglected to remember that Snowdonia lies between the two, and that electric cars (and normal cars for that matter) use up a lot more energy when climbing hills. I got off to a good start though, and twenty miles in, it still reckoned it had over 80 miles of range. Brilliant. I passed through beautiful Llangollen (for the third time this year), delightful Betws-y-Coed and as I climbed the next steep hill, noted that I appeared to have 38 miles of range for the 34 remaining miles. Ah. I knocked the cruise control down from 50mph to 45. Perhaps if I climbed hills more slowly, all would be well. Normally, travelling this slowly would pain me – even going uphill in the 2CV – but actually, it was really relaxing. Mainly because this was not a weekend and there was not much traffic. Incredibly, I still encountered folk going more slowly than me! I set the Adaptive Cruise Control and let the e-Golf follow their pace. Saving yet more miles. As we neared the A55, the range was again around 20 miles higher than my destination distance. I could do 60mph with relish. I arrived at Holyhead with a full 16 miles of spare range. The charger (or rather chargers) took a little finding, being hidden at the far end of the short term car park at The Port of Holyhead. I was pleased with my stats so far though. 5.2 miles per kilowatt hour is pretty impressive for the speed and terrain! At Holyhead, the only issue was that I first parked at a charger that didn’t have the DC CCS plug I needed. The other one did, and started charging straight away – no issues. Just to prove it. That’s a ferry in the background at Holyhead. The only other issue is that the port is unremittingly grim! I’m glad I only had to enter the main building to use the toilet. I charged to about 90%, giving a range of 100 miles, and set off back to Oswestry. There seemed a little more traffic on the way back, so I made more use of the cruise control. I found it accelerated more gently when placed in Eco mode, so I sat back to enjoy the views, listen to BBC Radio 6 Music on DAB (where terrain allowed) and focus merely on not steering the car off the road. I did get fed up with a dawdler in a BMW at one point and made a lavish, range-sapping overtake. That torque means you can zip past and expose yourself to danger for a very short period. Confident I’d make it back with miles to spare, I allowed myself the luxury of a 60mph cruise. There was one brief period after a long climb where the range dropped below the predicted mileage, and the car started frantically asking me if I wanted to find a charging station. For a giggle, I told it to do this, and it told me it couldn’t find any. None of the Electric Highway chargers seem to be on its map. This is poor. But I made it anyway, gave it another charge, drank more tea (I refuse to comment on cookie intake) and headed home. I had way more charge than I needed, so got a positive hoon on along the A44. It’s a nice car to drive briskly. 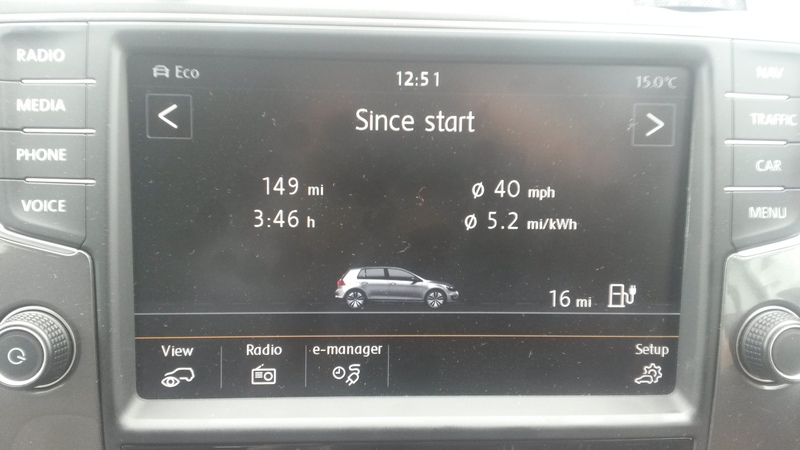 As I pulled up at home, the e-Golf reported that it’d clocked up 300 miles since leaving home that morning. In total, I’ve driven this car 700 miles since Thursday. Not bad going for any car, but unthinkable with an electric car only a few years ago. Truly, times have changed. In the previous post, we had rather nervously made it to Devon – 205 miles from home – in an electric van. It was our first experience of driving an electric vehicle long distance and while it hadn’t been without plus points, chilly toes and range anxiety were very real downsides. After managing to find an angle that allowed me to thread a cable in through a window, I was able to charge the e-NV200 at my parents’ house. As the cable went in via a window, we obviously had to do this in daylight hours. We went for a delightful walk to Bideford, watched crap telly and chatted about the sort of things families chat about. My mother wasn’t overly interested in our electric experiences, but then she’s never quite shared my enthusiasm for motor vehicles and doesn’t drive. The time came to head back. I knew there was a steep downhill section towards Tiverton, so range anxiety wasn’t a huge factor this time. We even stopped for photos. Proof. We were in Devon. Not the prettiest bit, I’ll admit. Actually, I’m going to divert from the narrative slightly here. Look at the picture above, and note how the rear wiper does a really good job of cleaning the wrong side of the rear window for right-hand drive. There’s a huge unswept area, right where you’d like to look. The van, with its split doors, is even worse – there’s only a rear wiper on the left-hand door! Sorry, but it bugged me. Returning to our road trip, we took on more electricity at Sampford Peverell. The 43 miles we’d travelled left us with 14 miles remaining, though I must concede that I had taken the Combi up to 70mph on the dual carriageway to see what sort of a difference it made. The phrase OM NOM sums it up pretty well. We pushed on, charging again at Sedgemoor Services near Bristol. It was starting to get a bit boring to be honest. Another half-hour wait for charge. Boring! Our 37-minute charge took the battery up from 13% to 87%. Frustratingly, the 77-mile range dropped almost immediately as we hit the motorway, to 68 miles. With 54 miles between charging stations, we were back to having chilly toes and playing with the trucks again as I aimed to keep our speed around 50mph. The weather got increasingly unpleasant, so wipers and lights had to be used, as well as bursts of air conditioning. This was not fun. At Llanelli, we had only 10% battery remaining. We knew the next 61 miles would be tough, so we’d let it charge for as long as possible. To save herself from utter madness, Rachel began noticing how long it was taking. It’s easier to charge an empty battery, and much harder to charge one that’s almost full. You have to remember this, because the regenerative brakes are much less effective if the battery is over 90%. Getting from 10% to 62% took just 17 minutes, with 85% status arrived at after 28 minutes. But, after another six minutes, the charge had only gone up to 91% at which point the charger turned off. The Combi ambitiously predicted a range of 87 miles (or 78 with the heater on). Surely that’d be enough? No, it wouldn’t. There are no more photos now, because our only aim was to get home. With us the wrong side of Lampeter, the Combi reckoned it had 22 miles of charge left. Home was still 24 miles away, with two VERY steep hills to climb. I was becoming so tense that I didn’t really need the backrest of the seat. I hate driving slowly, but began to treat 50mph as undesirably fast. The slightest downhill section left me battling whether to use momentum to gain speed, or to gently regenerate a little power. I mainly opted for the latter – just lifting the throttle to the point that one bar of regen was showing. The fabulously-named Pontrhydfendigaid saw our first steep climb. I made sure there was no traffic behind us, then nervously kept the speed to just 20mph. This was apparently using four bars of power – far less than if I’d tried to tackle the hill at normal speed. We were now less than nine miles from home. Surely we were going to make it? A downhill section allowed us some valuable regeneration, but battery life was now less than 10% with another climb to go. We ambled up it, with me nervously watching my mirror for approaching headlamps. We were travelling slowly enough to constitute a hazard, though it should be pointed out that heavily-laden lorries travel up this hill at about the same speed. Even my 2CV could go faster than this though, and our toes would be warmer! After another couple of miles, the displays stopped predicting mileage or showing battery life. That means less than 6 miles remaining, and less than 7% battery life. And we still weren’t home. I became ever more grateful that nothing was coming up behind us, nor coming the other way and forcing us to give up our desperately required momentum. But, we did make it. Just! If things had got really low, the van would have gone into ‘Turtle’ mode. This is your last chance – your must-take opportunity to find somewhere safe to park up. We can’t have avoided that by much but with serious hyper-miling, we had managed to drive 61 miles in the dark, in the depths of winter, in very hilly terrain. The relief was enormous! So, conclusions. I didn’t set out to see if electric power can be compared with petrol power for a journey like this. Only a quick glance at the facts proves that it isn’t. I knew the range would be around 60 miles. I knew ‘filling up’ would take half an hour. What I hadn’t really accounted for was the range anxiety. It was seriously stressful! Not did I fully appreciate the impact charging and slow driving would have on time. A three-hour journey took six hours. By deliberately choosing to stage this test in winter, I’d demonstrated another expected hurdle – heating. The e-NV200 lacks the clever heat pump technology of the LEAF, so keeping warm is very bad for range. I was disappointed that the windows misted up so readily though, so you have no alternative but to keep putting the heating on. Heated seats and steering wheels also do not keep your toes warm! I’d even worn thick socks. So, there’s absolutely no surprise that electric vehicles are still not ideal if you’ve got serious mileage to cover. However, it is possible! That wasn’t true not so very long ago. It means that if you’re struggling to decide on an EV because you’re worried about that occasional long trip, you don’t need to. Just allow plenty of time! I did find the impact on my usual driving style hugely upsetting. The thing is though, I now find I’m driving my own cars more gently. That desire to improve efficiency is addictive stuff actually. Sure, I still drive pretty quickly, but with a degree of smoothness I don’t think I possessed before this test commenced. It seems a little part of me is tuned into EV.